1. 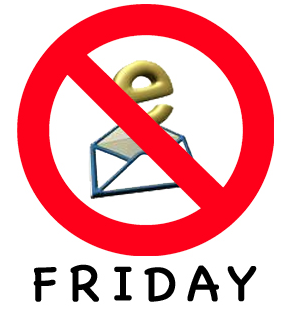 Email-free Day: Email has been getting out of hand for me lately. From wasted time on CYA activities (noted in an earlier blog) to the mass of incoming and outgoing messages I deal with everyday it is all a bit overwhelming. I checked my sent items this morning and quickly determined that in the past two weeks I have sent 422 messages. I decided today would be different. My goal? Zero sent messages. I will admit three times I caught myself pecking out a reply to someone but each time I quickly caught myself and either made a return call or just walked over to their desk instead. As a result, I learned a simple lesson. You talk to a hell of a lot more people in a day when you commit to sending less email. Presumably this is a good thing. This trial showed me email-free days could be worthy of a bit more experimentation. Finding a way to stop reading them for a day might be next. 2. Overtime solves nothing: When I chair a meeting it starts on time. People know this, so they quickly adjust and show up on time. Very rarely do I allow my meetings to go over the scheduled time slot too, and certainly not without checking on the participants to see if it is both ok and agreed it will be worth it. After participating in two meetings today that both started and ended late it occurred to me extra time at the end rarely solves anything. Whether you start on time or not, if you haven’t solved the problem by the scheduled end, rarely is another 15 minutes going to solve anything. Often it is better to move on and then, only if necessary, revisit later when everyone can come in fresh.